Mini Well, printed single faced cardboard on a roll so-called pallet wrap or decor well, is perfect for all indoor exposure. The product is especially useful along the shelves and counters, around pallets and gondolas because it is stable in itself and easy to set up. 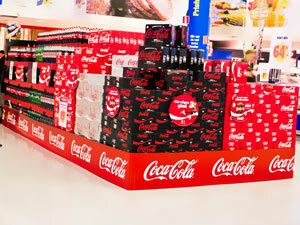 All major FMCG brands use Mini Well for permanent POS, branding and to strengthen their campaigns. A flexible and simple tool to increase your sales. Streamer is an excellent material for any exposure, whether in-store or outside. It can be provided in different substrates (paper or PE for example) and thicknesses depending your needs. 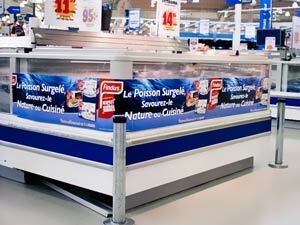 Adhesive streamer simply pasted in windows, freezers and refrigerators or directly on the wall. It is removable as a Post-It and leaves no trace on the surface. Choice of paper, PE or label material. Mark your presence on shelf. 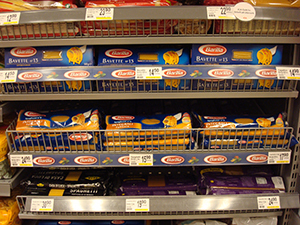 A shelftalker is a narrow band (30 to 40 mm) that is inserted into the shelf to increase the visibility of the brand and mark the linear of the products on the shelf. It raises awareness for a product or a campaign and strengthens your brand with customers. Choose between paper or label stock. Supplied on a roll. If you desire to create something outstanding we have the Die cut MiniWell, which is cut along the design. Let us help you find the best solution for your special demands. 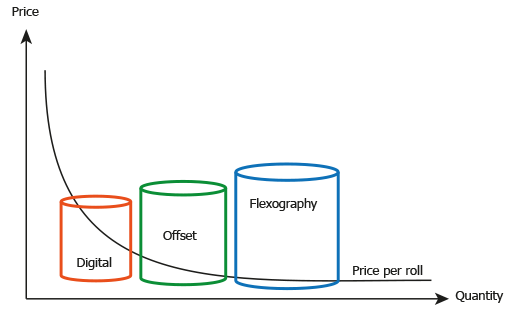 Flexography is suitable for large runs and when the same message is used over time. For the printing of packaging materials Flexography is most frequent. Production of a rubber plates which can be re-used for several years. Flexography provide nice solid color surfaces with individual dashes of colors (PMS), such as gold or silver, but also gives amazing results in 4-color printing. Offset is the most common method for various advertising materials, but can also occur in the packaging materials. Offset produces sharp prints with fine gradients and accurate color in 4-color. Since there is no need for the rubber cliché offset will be cost effective for smaller editions. Digital is the solution for short runs with short lead times. Digital printing is delivered quickly and are very high quality. Digital printing provides a photo printer’s resolution in 4-color. The print provides invisible transitions and optimal report lengths with great opportunity to design shifts.